The time zone change this weekend messed up my schedule and body clock big time! But it says spring is rapidly approaching and I am certainly ready for that after record snowfalls and global cooling this winter. 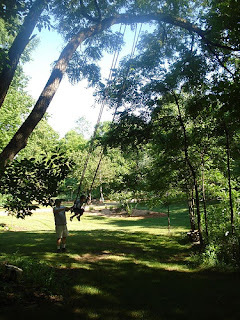 One of my favorite recreation activities to do with my kids when they were growing up and now my grandkids is to swing together or push them or do an under dunker. Now where did that name come from? Maybe because you are under the swing and someone usually gets smacked in the head or dumped off the swing. With spring almost here I look outside and cheer for the trees to bud and flowers to pop up so we can get outside and get some spring projects done around the house. We had family members who wanted to sell their house last year and needed a "tune up" to give it some added marketing appeal. So one spring weekend friends and family showed up with paint brushes, shovels, hammers, buckets and numerous other tools! We had almost a dozen folks at work and it was so much fun to help! The house sold and our efforts certainly paid off for the home owners! We did similar efforts getting ready for PCS orders and it usually included sharing our garage and store room items with our neighbors and friends. There were half used items that shippers would not ship or we needed to reduce for weight purposes. Rather than just throwing them away we found someone who could use that paint, refrigerator item or gas can as we cleaned up and moved things out of the house. The neighbors/friends were there and offered to help when we needed it too! Why not look around and see if a neighbor needs some help this spring with that big spring cleanup project! Spending a morning or afternoon or even the day helping a neighbor will bring great rewards. Maybe you have a project too and could alternate weekends so you both have an extra set of hands to make those heavy lifts easier and save the back a bit! What are your favorite projects in the spring? Getting ready for a PCS? Any ideas how to make the cleanup easier or how you helped a neighbor with a spring project? How about the newly arriving neighbor? Any ideas on how to help them with that new house? What is your best memory of someone assisting you? PS: We have built some awesome swings in the past and each one brought much laughter and exhilaration. Building a proper swing is essential and they can be any type, size or height but having the family involved in the project is the key! I love outdoor projects with family and friends and spring is the time to get out and do them!